The First Quadrant is the first compartment in a tetradic communication. The area is understood to be void of any recognizable particulars, of which the absence of division is the most prominent feature. Therefore, any distinction of an outline is impossible. ‘Visibility’ in the First Quadrant is a projection from temporal and locally determined distinctions made after a division took place. The First Quadrant is the ’empty space’ in a communication cycle. It provides the space in which a communication can develop in due course. The sense and concealed contents of the First Quadrant can only be measured from another quadrant. It would be characterized – in a dualistic perspective – by an invisible invisibility. This type of intuition is just as important as the reality of the material. Presence (visibility) is not only a matter of observation, but also of faith. As long as man existed there was the invisible and incomprehensible part within the field of observations. Religions have been built on it. God and gods are worshiped throughout the ages as the representatives of an imperceptible empire before a division took place. This unseen part of the spectrum must be accepted as an area of the greatest creativity and looked at as a place of human endeavors to build bridges in the unknown. The First Quadrant is the birthplace both of division-thinking and religious opinions. Belief – in its most general form and not linked to any religion – is encouraged within the quadralectic way of thinking. This particular type of faith does not conquer the truth or pretend to find an ultimate reconciliation. Assurance aims at access to the creativity of the invisible. The huge space of the invisible invisibility and its unimaginable possibilities should be incorporated in any communication, everywhere and all the time. In the Second Quadrant starts the Odyssey, a quest for an overture. There is a tendency to an approach. This advance is a process, which results at a given moment in a first sense of visibility – like an idea, an interpretation. These first notions can only occur when a division (of the Oneness of the First Quadrant) has taken place. The position can be portrayed – at least in a mature quadralectic framework – on the border of the First and Second Quadrant. A structure of thoughts develops into a first visibility (FV). This moment of equilibrium in the second quarter of the Second Quadrant, is a period of preparation for the things to come, for a further advance towards to ultimate possibilities of a communication. The exact position of the visibility moment cannot be established in the Second Quadrant, because the official unit of measurement has not yet been introduced. In dualistic terms one could speak of an invisible visibility. That means: the visibility has a mental framework, but misses the visible measurements of the Third Quadrant. An observer has made the formal decisions with regards to an approaching visibility (long) before the actual reality becomes a fact. The full scale and implications of the four-fold division – i.e. the meaning of the quadrants in terms of visibility – are known in the Second Quadrant, but part of its findings cannot be established in an empirical system. The visibility of the Third Quadrant has a dual character. It is also known as the ‘classical’ visibility. In a quadralectic context, it would be described as a visible visibility. The observation is tied to an empirical reality, which can only exist in a world of counter parts. Within the empirical world, there are only two types of observation: either in a closed system with (temporary) fixed boundaries or in an open system, without such boundaries. The first type (a closed system) assumes that the object of observation exists in an independent physical reality. Otherwise there would be no distance to the observed and the observer would have difficulty of using a measuring system. This static situation can be seen as the ‘Third Quadrant’ within the Third Quadrant (III, 3). In the latter case (an open system) there are dynamic boundaries. Nothing is ‘fixed’ in the classical sense, but randomness becomes a central theme. Modern physics, involved in the observation of physical phenomena, devotes a lot of attention to the statistical tendencies of the material and its behavior according to the laws of probability. The action takes place in the ‘Fourth Quadrant’ of the Third Quadrant (III, 4). The Fourth Quadrant gives a mirror image of the Second Quadrant, but is more advanced in an empirical point of view. The Fourth Quadrant offers the chance to utilize the diversity of the quadrants simultaneously. An observer in this quadrant can grasp the depth of the tetradic way of thinking. The (old) opposition between the linear, straightforward approach and the cyclic setting breaks down. Both motions merge, because in the full understanding of things, there is no formal difference. Any linear progress, if carried out long enough, becomes cyclic. And any large cyclic move can be regarded as linear if the scale is small enough. The key to a ‘coincidentia oppositorum’ is an awareness of the multitude, both in time and place. Nicholas of Cusa’s dictum, as expressed in his work ‘De Docta Ignorantia’ (Of Learned Ignorance, 1440) can be used, not as a means of reduction (to God) – like it was intended in the fifteenth century – but as a tool for extension of thought. The visible invisibility of the Fourth Quadrant opens up a wide perspective. The quadrants have their own type of visibility, but a dualistic classification in terms of visible versus invisible, as given above, is rather crude. A quadralectic communication is measured with its own means. It should not be characterized by an inflated oppositional pair. Quadrants are areas of a shift, with distinct shift values, providing the virtual distance between the communication partners. The insight came (to the author, in 1985) after the development of an arithmetical model of two four-division shifting along each other. The size and the direction of movement of the participating four-divisions were eliminated in order to produce a uniform situation. The outcome of the interaction – expressed in the shift-value CF – was drawn in a graph, consisting of sixteen line segments. This so-called CF-graph (fig. 2) is an expression of the distance between the observer and the observed in any conceivable communication and at any given stage. The abbreviation CF stands for the Communication Factor, the newly introduced measure of quadralectic visibility. The finding of the graph and its use as an itinerary of life has reminiscences to the famous Philosophers Stone. Fig. 2 – The CF-graph, consisting of sixteen line fragments, is the universal expression of a communication between two parts in a tetradic division environment. The abbreviation CF (for values on the Y-axis) stands for the so-called Communication Factor. This figure is a measure for the distance between the communication partners at a certain point in time and place. 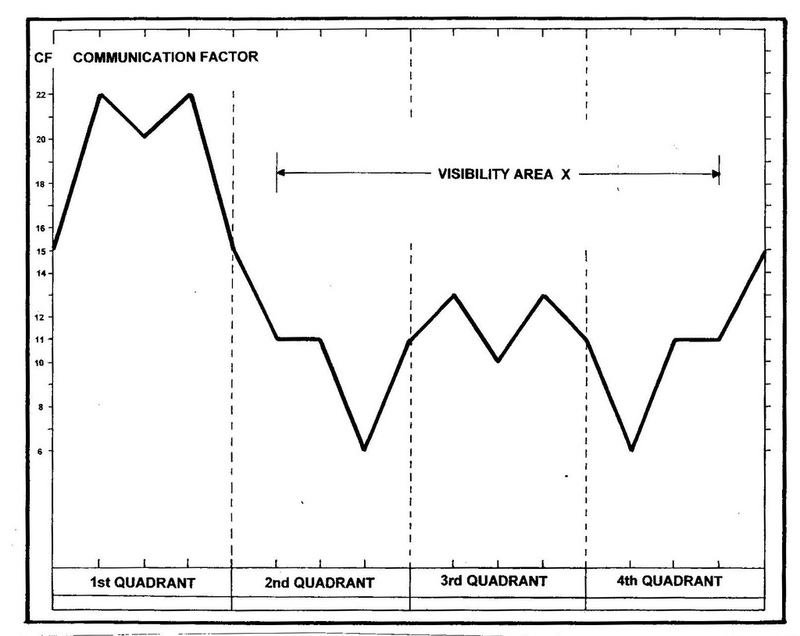 The visibility area X is a specific part of the communication cycle, which can be ‘seen’ by observers in an empirical framework. It runs from the first occurrence of CF = 11 (in the Second Quadrant) to the last occurrence of CF = 11 (in the Fourth Quadrant). The higher CF-values outside this area cannot be verified in the classical scientific way. The universal expression of the quadralectic communication was completed by the author in 1985. The ultimate aim in any human information exchange is to come to a better understanding of each other. If we can comprehend the visio of each other in terms of a (division) frame of mind than a great deal of clarity is gained. Many misunderstandings in daily life are caused by the failure to notice the observational position of the other. The quadralectic way is just a (re) interpretation of the historic tetradic way of thinking, which will now be applied in the field of architecture.